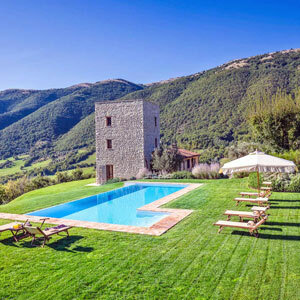 Torre Vista has been totally rebuilt from its original 12th century medieval watchtower into a luxury, family friendly villa. Beautiful views extending for miles, heated swimming pool and use of a nearby professional golf club. Within 30 minutes of Perugia, in idyllic Umbrian countryside. Villa Torre started as a 12th century medieval watchtower and has been totally rebuilt by extending the ground floor into an elegant, comfortable living area with soft hued stone walls, beautiful wood beamed ceilings and a cozy fireplace all furnished in comfortable upholstered sofas, chairs and ottomans. The kitchen is fully equipped for cooking up a masterpiece from the local markets, or dine in the nearby restaurant for those nights you are too tired to cook. The dining room wall has a bank of glass windows, offering lots of natural light, and French Doors that lead out to the large terrace with additional dining and living spaces and overlooking the large heated swimming pool and Jaccuzi. The villa consists of a medieval tower and a ground floor addition to accommodate family living areas. The new addition to the medieval tower is the charming and comfortable living room which leads onto the open space dining room with French doors onto the terrace and villas garden. The fully equipped kitchen is off of the dining room. The living room and the dining room are blessed with Umbrian sunlight flooding from the big windows. The living room sofas and chairs can accommodate 8 people comfortably. 1 bedroom with 2 bunk beds and en suite bathroom. The large 19 foot x 49 foot infinity swimming pool can be heated as well as the attached Jacuzzi. Wonderful views from the pool, luxurious gardens and lovely terrace / outdoor living room that includes dining tables, sofas, sun chaises, sun umbrellas and a nice wood burning Barbecue.